Beautiful bright orange grand opening ribbon with a delicate satin shine. Its vibrant color looks great live and on camera. Available in the following sizes based length and width: 25 Yds x 4 In., 25 Yds x 6 In., 50 Yds x 4 In., 50 Yds x 6 In. A successful first impression is the precursor to a successful business, and what better way to leave a profound first impression than a grand opening ceremony? A grand opening ceremony is a visually arresting event that introduces the world to your brand, and grand opening ribbons are the first tools to assist in the same. 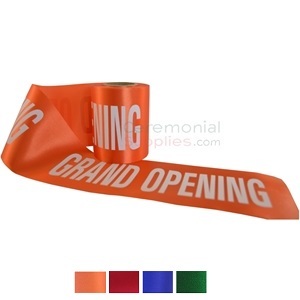 The Orange Grand Opening Ribbon - Plain has been designed especially with grand opening ceremonies in mind, and its vibrant hue and satin finish are sure to brighten the atmosphere at your ceremony. The ribbon measures 4 inches in width for optimal visibility, while the length is an ideal 25 yards to ensure it meets any other needs that might arise. The Scissors required for the cutting ceremony can be purchased separately. Browse through CeremonialSupplies.com for options. 12" L X 4" W, 12" L X 6" W, 25" L X 4" W, and 25" L X 6" W. Please note that prices vary by size selection.